Valuation is an important factor in both investment and acquisition. But how does one identify the factors that make your startup valuable? How do you make the best buck for your business? 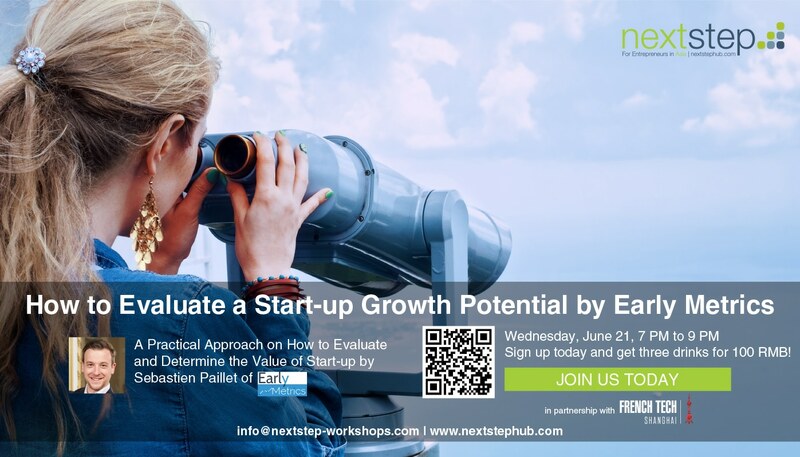 NextStep Workshops is partnering with Early Metrics and French Tech Shanghai to give you pointers on how to evaluate a start-ups growth potential. This event will be headed by Early Metric’s Founder, Sebastien Paillet. Join us on June 21, 2017 from 7PM till 9PM at Must Grill, Shanghai and start creating opportunities for your next start-up project. This event is available at no cost. You also get a special deal where you get three drinks for only 100 RMB! Sebastien Paillet is passionate about start-ups. In fact, his love for rationalizing the potential of young companies led him to start Early Metrics with Antoine Baschiera, his co-founder. With a strong background in accounting and management, Sebastien and his team has been helping startups and SME’s reach their potential. Some of his responsibilities include helping identify startups, meeting client expectations and reviewing their financial projections. Early Metrics also offers services such as business development, where they help manage the relationships between investor clients and asset managers. Sebastien attended IAE Lyon III with a degree in Financial Analysis and Management. In 2010, he took up his Master CAA in Accounting and Finance. He then acquired a Higher Diploma in Accounting and Management in 2013-2015 at the Chamber of Auditors, and later on became a Diploma Accountant at the Chamber of Auditors in Paris. Before founding Early Metrics, he became the Chief Financial Officer at Execo Holding in Lyon, France. He also founded U’Start Me, a social network for entrepreneurs, investors and anyone who is passionate about startups in 2013. He was also the Senior Financial Auditor for PwC France, where he was in charge of organizing and supervising interventions in line with the guidances of the managers and partners. Connect with Sebastien on LinkedIn here.